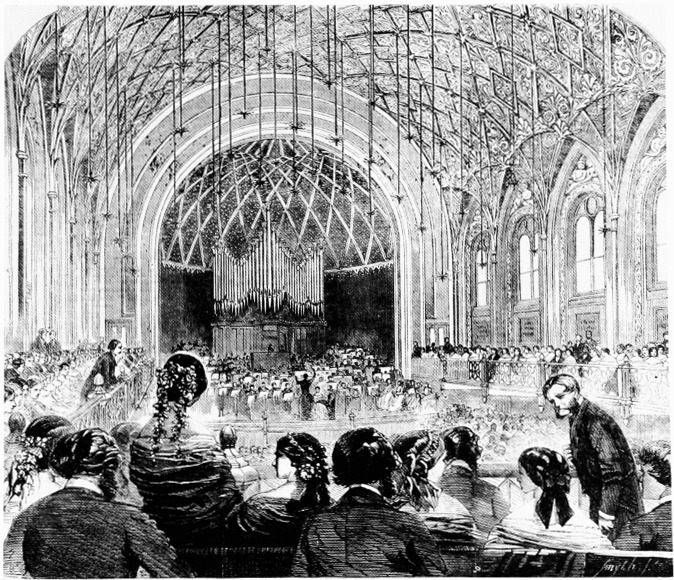 Interior of the main concert hall, 1857-58. Source: Plate 30b. in "St. James's Hall and London Palladium." Design for entrance on Piccadilly, 1856.
the gallery ... had a railing of cast iron, with geometrical frets in panels, rather Moorish in character. In every bay of the side walls was a tall round-arched recess, containing a decorative panel bek>w a "Florentine" window of two lights, the marginal frames of these recesses being decorated with "ﬂowing scroll ornaments, on a ground of orange—chrome yellow. The round arches were, in turn, set in recesses with two-centred arches, forming tympana that were modelled with "groups of figures in bold relief, holding scrolls on which are inscribed the names of Mozart, Handel, Beethoven, Haydn, Auber, Meyerbeer, Spohr, Weber, Gluck, Purcell, Rossini, Cherubin, and other eminent composers." On the piers between these pointed arches were slender colonnets, supporting the ribs outlining the groins over the recewes, and traversing the surface of the great semi-circular barrel-vaulted ceiling, forming a pattern of lozenge-shaped panels over which smaller lozenges were placed, the whole being decorated with arabesques "rich in colour and gilding; the smaller panels . . . Alhambran gold on a red ground." The wide marginal surrounds of the great east and west arches were simply treated, being divided by ribs into three concentric bands, and the semi-dome of the western apse was divided by interlacing ribs into a pattern of lozenges, diminishing in size towards the crown. The hall was "not lighted at night by a central chandelier, but by gas stars of seven jets each, suspended from the ceiling. The ﬁgures in the various designs were modelled by [Raphael] Monti; the other enrichments, by De Sarchy, are of plaster and canvas mn into moulds." The ﬂoor of the hall was of marqueterie. John Timbs's account ends by stating that "[t]he Hall is not, however, appropriated solely to Music" (427). Piccadilly frontage of St James's Concert Hall in 1885, after it had been extended in 1880 by Walter Emden & Co. Source: Plate 31a in "St. James's Hall, Piccadilly." 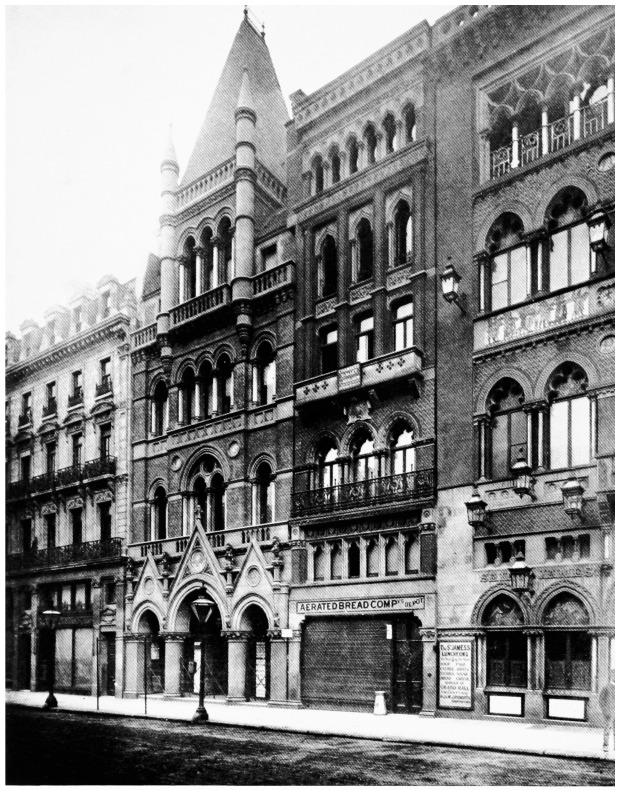 Extra frontage along Piccadilly was developed in Gothic Revival style after the purchase of three adjoining shops, and the result was featured in The Builder of 24 February 1883. At that point, there were still plans for its enrichment, notably a new "withdrawing room" for the Prince of Wales and other members of the royal family when visiting the Hall ("The St James's Hall"). It was all very lavish, but in the end it could not stand up to competition from other venues like the Royal Albert Hall, completed in 1871, and the newer Wigmore Hall (completed in 1901). Plate 30b: St. James's Hall and London Palladium. Survey of London: Volumes 31 and 32, St James Westminster, Part 2. Ed. F. H. W. Sheppard (London, 1963). British History Online. Web 10 May 2018. Plate 31a: St. James's Hall and London Palladium. Survey of London: Volumes 31 and 32, St James Westminster, Part 2. Ed. F. H. W. Sheppard (London, 1963). British History Online. Web 10 May 2018. "The St James's Hall, Regent Street and Piccadilly, London." ArthurLoyd.co.uk. Web. 10 May 2018. "Swallow Street to Glasshouse Street." Survey of London: Volumes 31 and 32, St James Westminster, Part 2. Ed. F. H. W. Sheppard (London, 1963). British History Online. Web 10 May 2018. Timbs, John. Curiosities of London. London: J. S. Virtue and Co., nd. (but must be the 1867 ed.). Internet Archive. Contributed by Hooghly Mohsin College, India. Web 10 May 2018. Weinreb, Ben, Christopher Hibbert, Julia Keay and John Keay. The London Encyclopaedia. 3rd ed. London: Macmillan, 2008.